Before this event, the ground reaction forces already change to prepare for the backswing. LB Late backswing (club-based) This is when the club shaft becomes vertical in the face-on view. Depending on the swing style used (e.g. early wrist cocking), this event may appear earlier than LBA in some golfers. EPR End of pelvis rotation This is when the pelvis changes its direction of rotation. Normally, this has to occur reasonably earlier than TB. The upper torso (thorax and shoulder line) further separates from the lower torso (pelvis) beyond this event. In a dynamic golf swing, the moment arm of the frontal-plane GRF moment becomes max. around this event. This is an imortant event. The frontal-plane GRF moment and pivoting moment become maximum at or before this event. ED Early downswing This is when the club shaft becomes vertical in the face-on view. The angular speeds of the body parts (pelvis, thorax, shoulder line, and the upper lever of the functional-double-pendulum reach their max values about this event or before. If the peak anguar speeds occur after this event, it means the peaks are delayed. This event is used in functional swing plane calculation. The clubhead trajectory between MD and MF is used in the calculation. ZC Zero cocking This is when the upper lever of the functional double-pendulum (the line drawn from the mid-trunk point to the mid-hand point) aligns with the club shaft (lower lever) after impact in the swing plane view. 'Mid' is used for the instants when the club shaft becomes parallel to the ground in the face-on view. 'Early' is used for the instants when the shaft becomes vertical in the face-on view and the event occurs before the corresponding 'mid' event. 'Late' is used for the instants when the shaft becomes vertical in the face-on view and the event occurs after the corresponding 'mid' event. 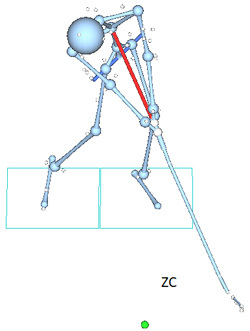 ZC (Zero cocking) can be defined in the FSP (functional swing plane) view (Figure 2). The red line shown in Fig. 2 is the upper lever of the functional double-pendulum model: the line drawn from the mid-trunk point (hub) to the mid-hand point (hinge). The lower lever (club) is aligned with the upper lever at ZC. More events can be added if necessary, such as MGF (Max. GRF). This division method is obviously based on club's direction of motion before and after the impact. However, the true beginning of the downswing may not be TB as the body (the pelvis in particular) already rotates in the downswing direction at this point. In biomechanical point of view, it may be more meaningful to use EPR as the beginning of downswing. Also the phase between BI and MF (or BI and ZC) could be considered as a continuation of the downswing motion. So for the analysis purposes, the extended downswing phase (EDS) may be defined as EPR to MF or EPR to ZC (Figure 3).